We take a moment to pick our favorite game worlds from 2016. As our Best of 2016 countdown continues, we take a moment to ask ourselves: "What game universe from 2016 is so interesting that we'd like to live there full-time?" We will continue publishing a different category each day through the end of the year, leading up to our final vote for best game of 2016. Join us as we countdown to our Game of the Year! And remember, you can follow the rest of our 2016 coverage in our handy hub. Videogame worlds can be dark, dystopian places, but they can also be pretty neat. As usual, this year's crop of games were loaded with lush, interesting worlds that demanded hours of exploration. Here are our favorites. Alright, stay with me here. I've spent a lot of time thinking about how Pokemon's world works, but it wasn't until I played Sun and Moon that it finally hit me: Pokemon is Westworld! Just think about it: People spend thousands of dollars for the right to hang out and battle with cuddly monsters that are seemingly unaffected by attacks that would vaporize a normal creature. That's why Pokemon's society seems to be built around battling monsters; why the villains are so harmless, and why trainers will scarf hamburgers despite their being no visible livestock (you won't see anyone butchering a Miltank). It's also why monsters seem to be periodically "discovered," then incorporated into the broader ecosystem—it's all one big theme park! So basically, I want to live there. 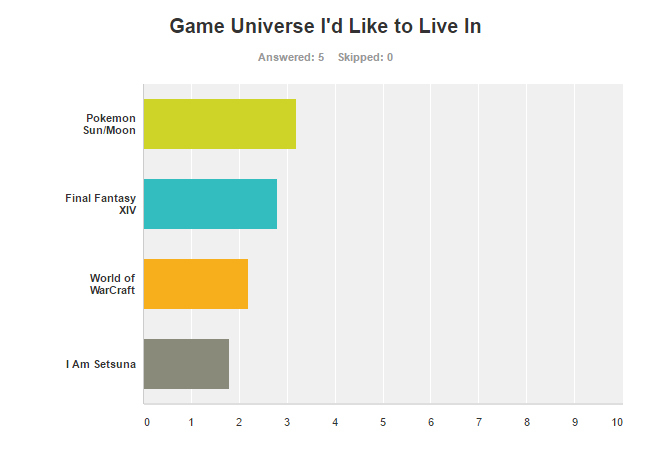 I'd almost do Azeroth, but people keep dying there. Instead, I'll go with Eorzea. The world of Final Fantasy XIV has all the benefits of being a Final Fantasy game, but you'll not dead simply because you're not one of the chosen few in the main cast. (Seriously, life as a civilian in any other FF game must be dire.) In Eorzea though, I get to be a Dragoon, Monk, or Paladin! I have a chocobo! There are Moogles and Maids, Black Mages and Bombs. There are airships! If you have to choose one Final Fantasy world to inhabit, XIV's is the best. With my combined WoW character playtime running at over a man-year at this point, I could argue that I've already become a semi-permanent resident of Azeroth over the last 12 years. For the majority of that time, I've played the game pretty much daily, enjoying its myriad of facets from questing and pet battling through dungeon crawling and exploring to end-game raiding and PvP. No other game comes close to engaging me so deeply and consistently: A combination of characters that I love, and an ever-changing world that's packed with endlessly entertaining activities makes World of Warcraft my all-time favorite game. Snow? An endless piano concerto serenading you through your days? What's not to like? One of the reasons Pokémon keeping chugging along after all these years is that it's world is just so darn appealing. Seriously, who wouldn't want to live in a paradise in which people while away their days in autonomous communes fueled by advanced technology? (Alternative explanation: Pokémon is a dystopian corporatist future in which companies like Silph Co. rule the world). I mean, yeah, Groudon could suddenly emerge from the Cave of Origin and cause a mega-drought that sends your little town straight to hell. But hey, you'd never be bored. Tagged with 2016 in review,	3DS Handhelds,	Articles,	PlayStation 4,	PlayStation Vita,	Pokemon Sun and Moon,	USgamer,	Xbox Consoles.